Stunning papercut ketubah. Azoulay is renowned for his beautifully decorated ceramics, and has now applied his talents to ketubah artistry. 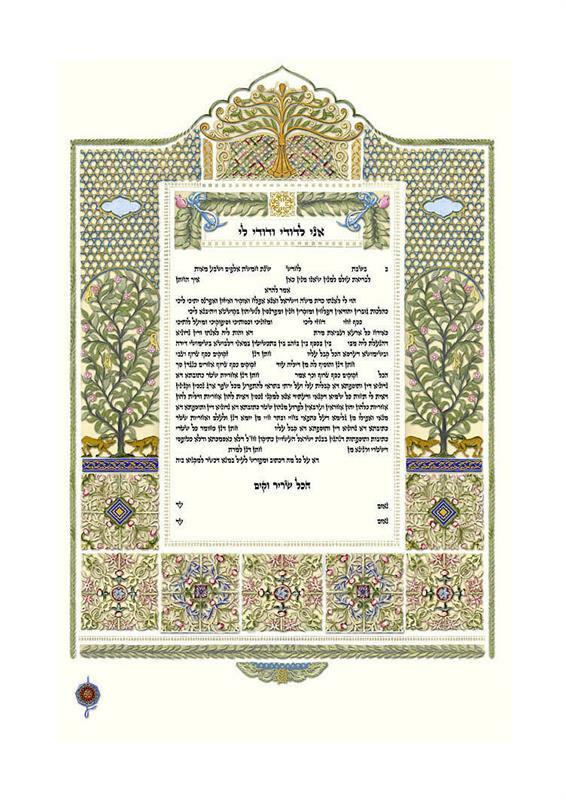 Colours on this papercut ketubah vary due to the delicate nature of the laser paper-cutting technique. Gentle deer, symbols of love and grace, repose under fanciful trees resplendent with flowers and birds. The sky, above, is formation of interlocking Star of David motifs. The words from Song of Songs-- Ani ledodi vedodi li--I am my beloved's and my beloved is mine-- are inscribed below a canopy of myrtle leaves (the chuppah). Crowning the artwork is a golden menorah --a reference to the light of the Torah: illuminating the world with its great wisdom. A limited edition giclee lithography, paper cut on fine acid free paper with 24 karat genuine gold leaf detail. Available in a variety of standard texts: orthodox, reform and egalitarian.
. Please contact us for details.